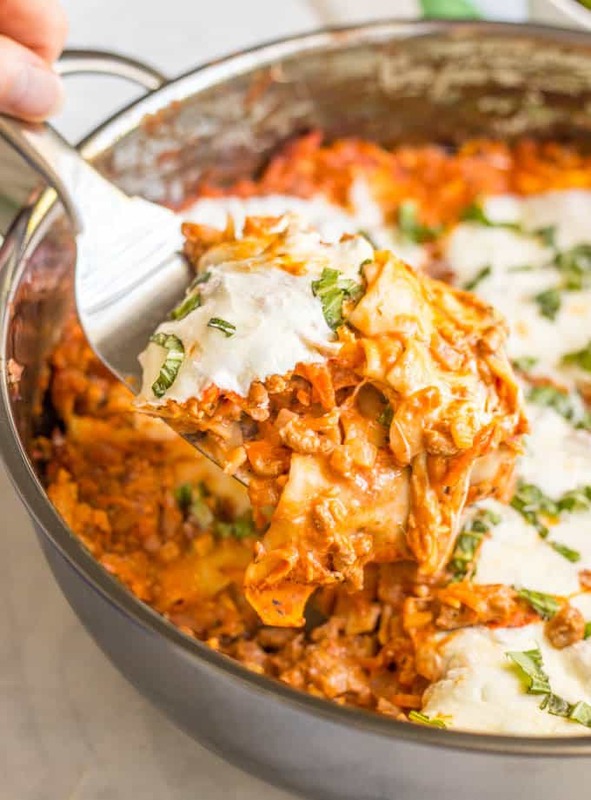 Easy healthy one-pot lasagna is a great way to get a homemade lasagna served up without all the fuss! It’s perfect for a delicious family dinner! I have partnered with ALDI on this post. As always, all thoughts and opinions are my own. And today I’m going to keep it short because I’m off for another long weekend (I know, I’m so lucky!!) — this time to Michigan for a girls retreat with some fellow food blogging friends. 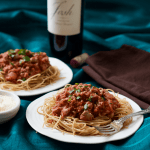 Speaking of food and wine… let’s get to today’s recipe! I grew up eating huge tin-foil frozen lasagnas. It was just how my mom did lasagna. 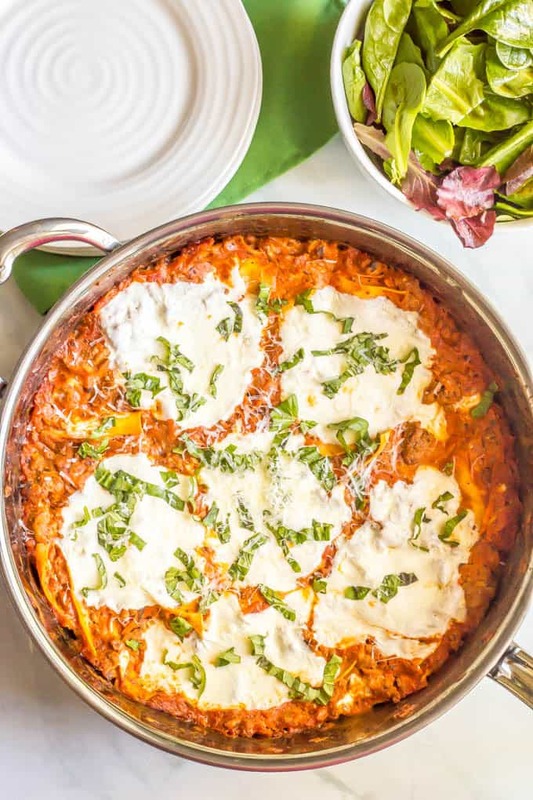 When I was ready to make lasagna for my own family — it was high time my kiddos tried that deliciousness! — I could see why she went that route. 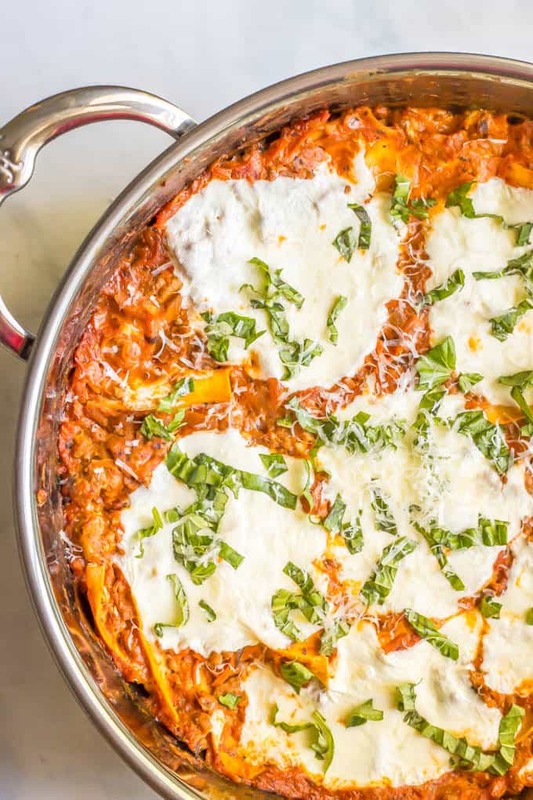 Homemade lasagna can be such a pain! All the fussing over the noodles and the layering and bringing all the different parts together from all the different pots and pans. No wonder the frozen versions call to so many people! But, you know I’m going homemade, and you know I’m going to make it as easy and fuss-free as possible. 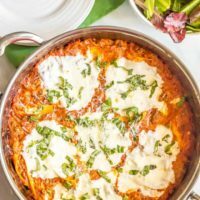 So I made this easy healthy one-pot lasagna for one of our Sunday night family dinners, and we were all bowled over! I’m not sure I’ll ever go back to the traditional lasagna! And before I get into the yummy details, I just want to say that I’m so excited to be partnering with ALDI again! I became an ALDI convert (yes, I do think that’s the technical terminology for falling in love with a grocery store 😉) earlier this year and both my kitchen and my budget have thanked me for it. You can find all your basics and an amazing selection of cheeses and tons of great fresh produce, including organics. Quick tip: Pick up some salad fixings while you’re there to go along with this easy lasagna recipe! I use shallots, which are a bit milder than regular onions, but you could certainly substitute a white or yellow onion here. Just make sure it’s finely chopped. 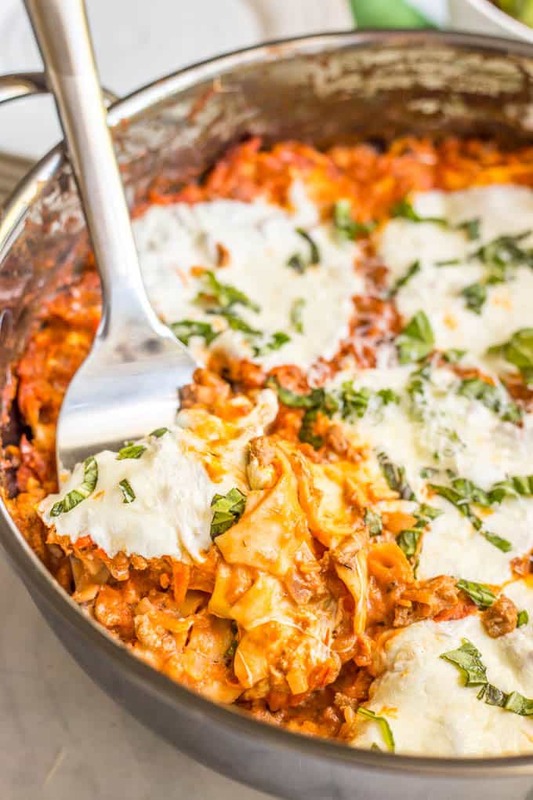 I use ground turkey (93% lean) for my lasagna (just like I do for my homemade spaghetti dinner and my go-to turkey tacos) but you can substitute ground beef if that’s what you prefer. I opted for a tomato basil sauce but regular marinara sauce (or some homemade spaghetti sauce) would be great here too. Go with your favorite flavor. 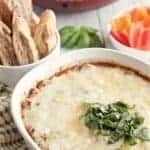 You can broil this for 1-2 minutes or turn your oven up to about 425 degrees for the last couple of minutes of cooking to brown the cheese on top, if yours hasn’t browned much. Just keep an eye on it! Fresh mozzarella really is a must here. 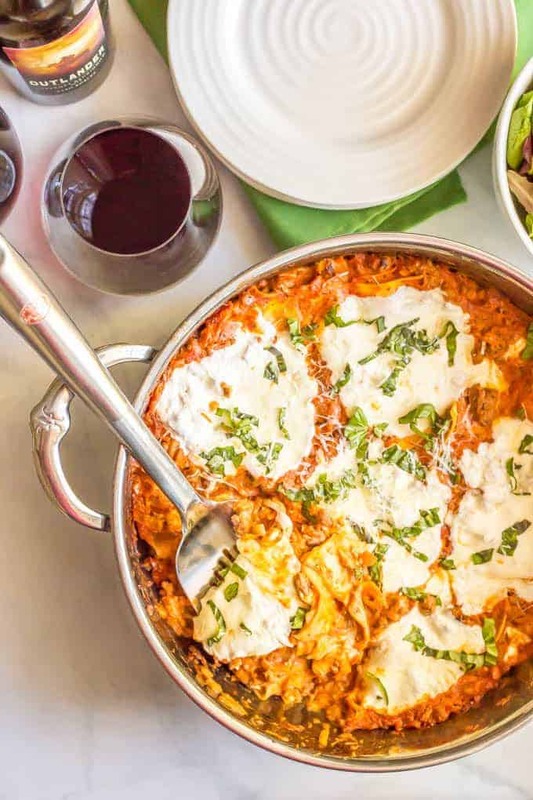 If you love lasagna (doesn’t everyone?!) 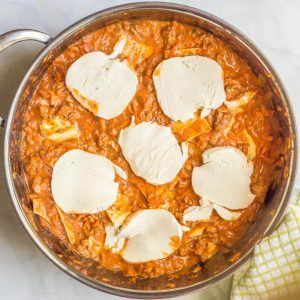 but hate all the fuss that goes into it, I hope you’ll try this easy healthy one-pot lasagna for a delicious homemade version! 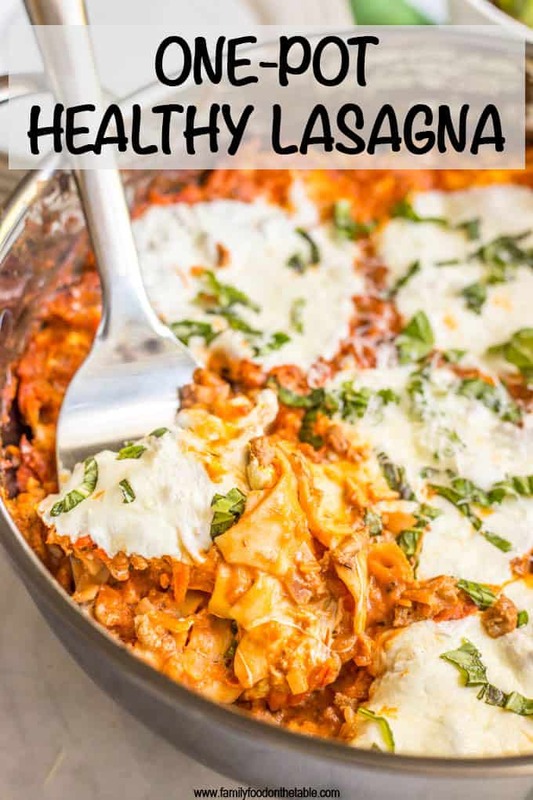 Easy healthy one-pot lasagna is a great way to get a homemade lasagna served up without all the fuss! Heat oil in a large pot (or use a Dutch oven) over medium heat. Add shallots and carrots and sauté for 2-3 minutes, until tender. Add ground turkey to the pan, season with salt and pepper and cook until browned and cooked through, breaking up with a spoon as it cooks. Add the tomato sauce and red wine, bring to a simmer then reduce heat to medium-low and cook for 10 minutes. Add cream cheese to the skillet and stir until it’s melted into the sauce. Break lasagna noodles into 3-4 pieces each and nestle them into the sauce so they are covered (and not sticking out the top). 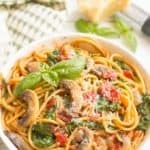 Tuck mozzarella cheese slices in among the noodles and layer the rest on the top of the pot. Transfer the pot to the oven and bake at 350 for 20 minutes, until noodles are al dente, cheese is melted and everything is bubbly. Let stand for 5-10 minutes, to let it set up, before scooping and serving. I use shallots, which are a bit milder than regular onions, but you could certainly substitute a white or yellow onion here. Just be sure it's finely chopped. I use ground turkey for my lasagna, but you can substitute ground beef if that’s what you prefer. I opted for a tomato-basil sauce but a regular marinara sauce (or some homemade spaghetti sauce) would be great here too. 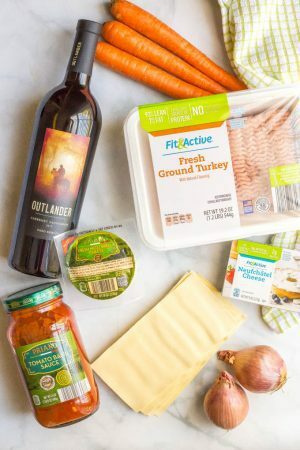 If you need this to be alcohol-free, you can substitute chicken or beef broth for the red wine. You can broil this for 1-2 minutes or turn your oven up to about 425 for the last couple of minutes of cooking to brown the cheese on top, if yours hasn’t browned much. Just keep an eye on it! One-pot recipes are my favorite! So easy and do-able! I hope you try this one! I love one-pot recipes, especially when they combine such delicious ingredients like these. Thanks for the recipe! I’m with you Diana! I hope you give this a try! So happy to find this version ! My son and me a just like two Garfields 🙂 Never enough of lasagna ! Thank you so much ! Yay, it’s definitely the easiest way I know to do lasagna. I hope you and your son love it! Hi there! I'm Kathryn, a health and nutrition editor, wife, mother of two little kids, and devoted food and home cooking nut. 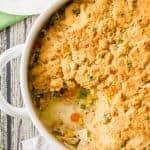 I've got lots of easy recipes and resources to help you get delicious family food on your table! Learn more about me. 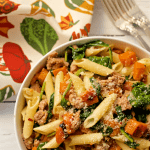 Sign up and get my FREE e-cookbook, Easy Weeknight Dinners! Sign up for new recipes and get my FREE e-cookbook! 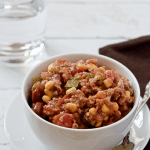 Sign up for new recipes and you'll get my FREE e-cookbook, Easy Weeknight Dinners!